Now Archived! Antarctica Day Celebration event with Lesley Anderson and Dr. Jim Madsen on Monday, 4 December 2017. You can access this and other events on the PolarConnect Archives site. 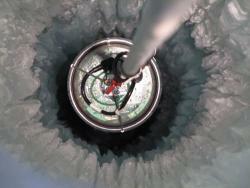 A DOM (Digital Optical Module) being lowered into the ice. Photo by Jim Haugen. Why go to the bottom of the world to explore the universe? Because it is a nearly ideal place to study one of the most elusive particles known, the almost massless subatomic messenger called the neutrino. The IceCube Neutrino Observatory at the South Pole searches for neutrinos from the most powerful astrophysical sources: events like exploding stars and extreme environments around black holes and neutron stars. This requires a large detector, and IceCube is the largest detector by volume ever built, encompassing a cubic kilometer of instrumented ice. That much ice weighs more than all the people in the world! The fully built Askaryan Radio Array (ARA) project will have an effective volume 100 times larger than IceCube. The tradeoff is that it will only be capable of observing radio waves from interactions with extremely high energy neutrinos, a million times more energetic than the neutrinos produced by cosmic rays in the atmosphere. IceCube studies those lower energy atmospheric neutrinos, 100,000 per year, to learn more about neutrino properties, including their ability to transform from one type to another. The universe is a huge and mysterious place that is largely unexplored. New technologies and creative approaches allow us to see things that aren’t directly viewable. Neutrinos will reveal new information about the Universe that can’t be recorded with optical or even more exotic telescopes that measure other types of light, like radio waves, microwaves, x-rays, and gamma rays. Many different roles and talents are needed to develop new approaches—technicians to make and operate new machines, computer experts to store and retrieve data, and scientists to define goals, identify promising projects, and guide students. IceCube and ARA are discovery instruments that will lead to a greater understanding of the cosmos and will hopefully uncover new mysteries for scientists to solve. The IceCube building. Photo by Michelle Brown. The team works at the Amundsen-Scott South Pole Station in Antarctica. The IceCube site is about one kilometer from the South Pole station, which supplies the necessary logistics of food, power, and shelter. Despite the cold outside, life inside the station is relatively luxurious with comfortable beds, cooked meals, and showers twice a week. The South Pole is reached by plane from McMurdo Station on the coast of Antarctica, accessible from the end of October through mid-February, after which time temperatures become too low for planes to operate safely. 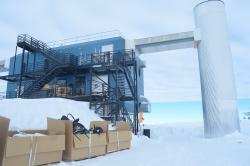 About 40 people remain at the South Pole station the rest of the year, which is known as wintering over. IceCube has two people dedicated to overseeing the operation of the telescope during this period at the South Pole. 2017 Antarctica Day celebration with PolarTREC teacher Lesley Anderson speaking from the South Pole, and researcher Dr. Jim Madsen discussing the IceCube Neutrino Observatory and the Askaryan Radio Array. This event was held on 4 December 2017. Thank you, Kirk! The pictures and videos don't even do it justice! Thanks Armando! I appreciate your support along the way! Thanks so much, Michael! I really appreciate all the questions that your students asked and want to thank you all for following along with the expedition!